Are you ready, Tysons?? It’s time for our annual month and a half of Oktoberfest! We will have events starting with our Kickoff on Saturday, September 22nd until the Finale on Saturday, October 20th. Oktoberfest Kickoff (Saturday, September 22nd, 3-7pm): Come kickoff OKTOBERFEST with our “tapping of the keg” a special Weihenstephaner Ceremonial keg sent specifically from Germany to us for this special day! This FREE Family friendly festival is packed with TONS of activities for all ages! Check our Facebook for more information. 2nd Annual OktoberBreast (Sunday, September 30th, 12:30-4:30pm): Back by popular demand, you are cordially invited to the second annual OktoberBreast! Please join us for an afternoon filled with food, beer, music, and dancing. Your $21 ticket gets you a beverage and snack, and dJ g-miLLs will be back to keep the party going all afternoon. Bring cash (or Venmo) for a multitude of awesome raffle prizes. 100% of our proceeds support the Willow Foundation, a 501 (c)(3) organization that provides funding for advanced stage cancer research. Can’t make it but still want to donate? Check out our website for donation information. All donations are tax deductible. The Brewers 2nd Annual Chili Throwdown (Friday, October 5th, 5-8pm): Brewers and Cideries slinging their craft beers and ciders and their own take on chili! Check our Facebook for more information. Fight Night: McGregor vs. Khabib, No Cover (Saturday, October 6th, 10pm): Come watch the UFC 229: Khabib v.s. 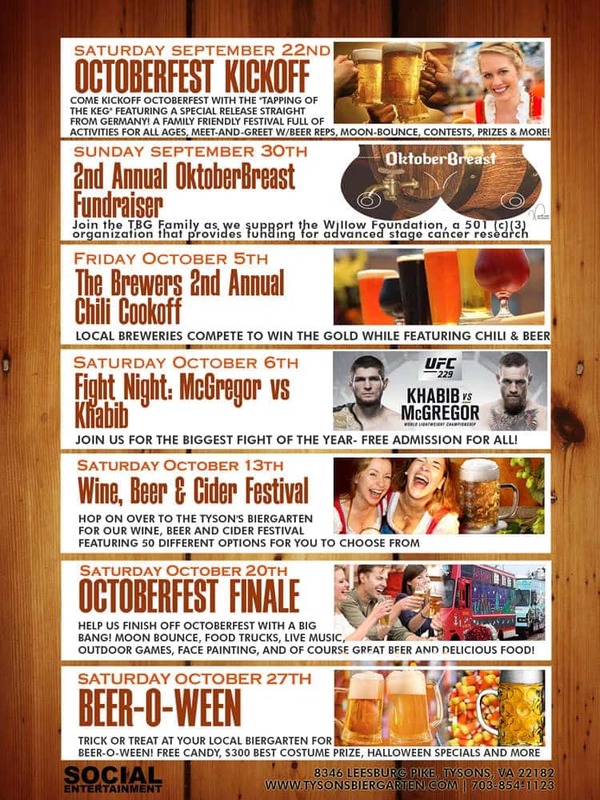 McGregor fight Saturday, October 6th at Tysons Biergarten. Main card fight starts at 10pm, so come join us to watch this epic fight go down! Check our Facebook for more information. Wine, Beer & Cider festival (Saturday, October 13th, 3-7pm): Join us for a Wine, Beer & Cider Festival featuring over 50 different beers, wines and ciders! Check our Facebook for more information. Oktobefest Finale (Saturday, October 2oth, 3pm-2am): Help us finish Oktoberfest with a bang! Featuring live music, outdoor games, face painting, and of course delicious Bier and food, everything you need for a great time! Check our Facebook for more information. Bier-O-Ween (Saturday, October 27th, 3pm-close): Halloween aka All Hallows’ Eve is a celebration observed in a number of countries at the end of October, the eve of the Western Christian feast of All Hallows’ Day. It is “widely believed” that many Halloween traditions originated from the ancient Celtic harvest festival Samhain. Samhain and other such festival had pagan roots. Join us here at Tysons Biergarten for our Halloween party, aka Bier-O-Ween. We promise you that it will not be something for the “faint at heart”. Check our Facebook for more information.